Can table service improve your coffee shops' profitability? Since coffee culture really took off in the UK, coffee shops have been using an adapted version of the Italian model of counter service as standard. 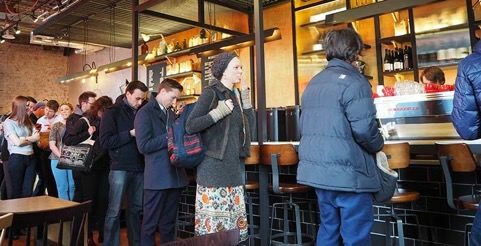 This means that customers queue up at the counter to be served, with the focus being on specially trained baristas producing the drinks as quickly as possible while the customer waits. More and more coffee shops in the UK and throughout Europe have been starting to experiment with using table service as an alternative, shifting the focus to creating the most relaxing environment possible where customers aren’t forced to queue up to be served. While this may seem like it would come at the expense of speed and efficiency, could it potentially end up making coffee shop owners more of a profit? There are pros and cons associated with each approach, so the solution isn’t necessarily as easy as you might hope. Conventional logic would suggest that the more coffee you produce, the more profit you can make. However with table service the waiting staff have a much bigger selling opportunity available to them. They can build a rapport with the customers much more easily and going back to offer more drinks is just seen as good customer service. As well as the upsell opportunities you must consider pricing, as many people will expect to pay slightly more at cafés or restaurants with table service. It builds an entirely different atmosphere and will attract a different kind of clientele, so while you may lose customers who just come in to grab a quick coffee on the go, you would gain the customers that will sit and stay for a while and value the more personal service. Which option would work best for me? Space – This one is probably the most important factor. You need to have enough room to seat a large enough number of people to make table service a viable alternative. Location – If your shop is right next to a train station and your main business is commuters, moving to table service may push out your more regular customers. Staff – Would you need to hire additional staff to manage the table service? You definitely need to include this in your calculations to see which would be more profitable. Pricing – In order to turn a higher profit, would you need to increase prices, and if so by how much? One way to approach changing over to table service whilst minimising the impact on profit would be to add a level of automation to your coffee making process. For example, using the WMF Espresso machine you can speed up beverage production with fully automated grinding and tamping, meaning that waiting staff could make the drinks without the need for an experienced barista. You could go one step further with fully automated bean-to-cup machines like the WMF 1500 S+ completely negating the need for trained baristas, meaning the waiting staff can also be responsible for making the drinks with no need for specialist training at all. Download a brochure to see the full range of WMF coffee machines and related products.